How to play Bingo Zone? What is the chat game ("DBB")? What are the Gold balls? If I daub outside the pattern (for example, to claim a Gold ball) will I jeopardize my win? Why does the ball caller sometimes pause and then call out a bunch of balls in a row? If I enter a game late, do I have less of a chance of winning? To win in the Bingo Zone, you must match the pattern indicated and then click the "Bingo" button. In the example here, the pattern is a diamond shape. The pattern you need to match is printed on each of your bingo cards (the winning pattern is a light blue color; not the white color). You can daub any square outside of the pattern -- for example, to claim a Gold ball for bonus GV Rewards. (What are GV Rewards?) Daubing outside the pattern has no negative repercussions; when you try to claim a bingo win, our system only checks to verify that you daubed the balls that matched the stated pattern. At the start of each round, you have the chance to pick three bonus balls for a special chat game. If you enter the current game late, you won't be able to pick bonus balls for that game. However, you will before the next game begins. To enter the Promotion, log on to Gamesville at http://www.gamesville.com and follow the directions set forth in the registration area. You will be asked to provide your name, address, email address, and date of birth and other information. Once you have completed the online registration process, you can play any Gamesville Game. After you have registered as a Gamesville Member, to play any Gamesville Game visit http://www.gamesville.com, sign-in and click on your selection. 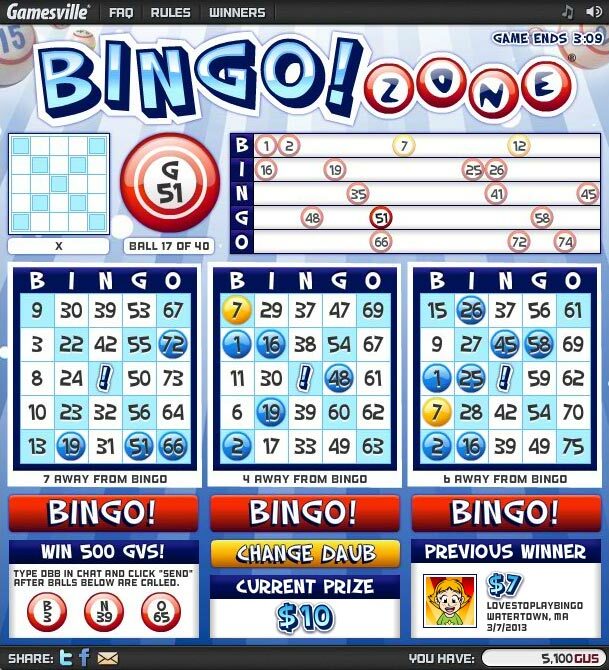 To win a Bingo Zone game, check off the specified pattern using any one of the three bingo cards provided, then click the "Bingo!" button. The first valid claim wins. The specified pattern is marked on the bingo cards. The pattern is also pictured in the upper left side of the game screen. One new bingo ball is available and automatically displayed every seven seconds. The game ends after 40 bingo balls have been dropped, whether or not there is a winner. The odds of winning depend upon the number of individuals participating. Use your mouse to check off the numbers on your cards that correspond to the numbered balls shown on the bingo board. When you click a square on the bingo card, it will display a daub mark to show it has been checked. You can remove the daub mark by clicking the square a second time. You do not have to check off the numbers that are not needed to complete the specified pattern. But be sure the winning numbers are all checked off before clicking "Bingo!" When a game ends, it is followed by a brief intermission, then a new game begins. The Bingo Zone runs around the clock, 24 hours a day, seven days a week. Each Bingo Zone game lasts approximately six minutes, followed by a brief intermission. The Bingo Zone includes an optional chat game, "Dickie's Bonus Balls", that can be played alongside the main game. In the moments before each game begins, you'll be presented with a grid of numbers, 1-75; to play, select 3 numbers by clicking on them and then click the submit button. 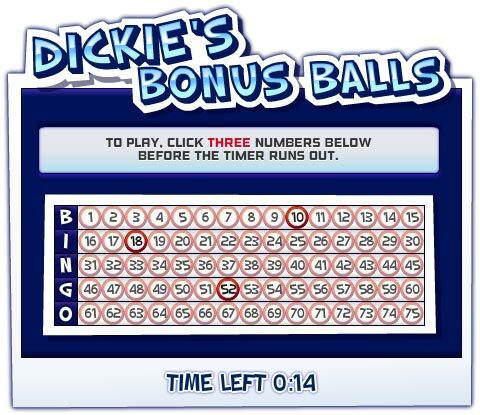 NOTE: If you enter during an intermission, or after the current game has begun, you may not be eligible to play Dickie's Bonus Balls. During the game, watch the call board. When Dickie calls ALL THREE of your numbers, type "DBB" or "dbb" in the chat window. If your bonus numbers match those numbers called by Dickie during that game, you automatically win 500 bonus GV Rewards! The Gold balls represent chances to win additional GV Rewards. If you daub numbers on your cards that match the gold bingo balls, you'll win bonus GV Rewards. NOTE: The numbers can appear in the stated pattern or outside the stated pattern. If I daub outside the pattern (for example, to claim a Gold ball), will I jeopardize my win? No. If I daub outside the pattern (for example, to claim a Gold ball), you will not jeopardize your win. Our system only checks to verify that you daub the balls that match the stated pattern, regardless of whether they're gold or not. To win, what matters is that you daub the balls that match the stated pattern and click "Bingo" before the game ends. Gamesville requires a constant connection between your computer and our servers. This is because the game on your computer is constantly "talking" with our servers, and vice versa, communicating information about GV Rewards, chat messages, balls called, and so on. If anything interferes with that connection--for example, if your Internet Service Provider goes down for maintenance or experiences a network "hiccup"--you will not receive the latest ball called on your computer, even while others do on theirs. When the network interference on your end clears up, all the balls that have stacked up in those few seconds will come racing down toward you, making it seem like our bingo caller, Dickie, is suddenly on speed.